After issuing recommendations and asking Gerding Edlen, the developer of the Capitol Hill station sites, to return for a second Design Review meeting on October 11th, the East Design Review Board has approved the proposed design! This is a huge win for the Capitol Hill community, who has been very active in the process to develop the neighborhood priorities and guidelines that influenced Sound Transit’s developer selection and informed the proposed design. Thanks to everyone who submitted letters or attended the Design Review meetings in support of the developer team’s plan for the Capitol Hill TOD that includes affordable housing (including one building that will be 100% affordable housing managed by Capitol Hill Housing), a public plaza, a permanent home for the Capitol Hill Farmers Market, community meeting space, anchor retail and a retail space that can accommodate a daycare facility. The project will move forward with ground breaking slated for Spring 2018. The Capitol Hill Champion is actively advocating for the incorporation of community goals in the redevelopment on top of Sound Transit’s Capitol Hill Light Rail Station. We’re working hard to promote meaningful and responsive community engagement throughout the development process for these station sites. Please browse around to learn more about the Champion and the history of community engagement to date. Additional information can be found in our library of resources and the summary of community priorities for developers moving forward. Please contact us if you are interested in volunteering or participating. In Fall 2013, Seattle City Council and Sound Transit unanimously approved the proposed Development Agreement for the Broadway Station sites that will implement some of our neighborhood vision. The graphic below highlights our advocacy successes to date! 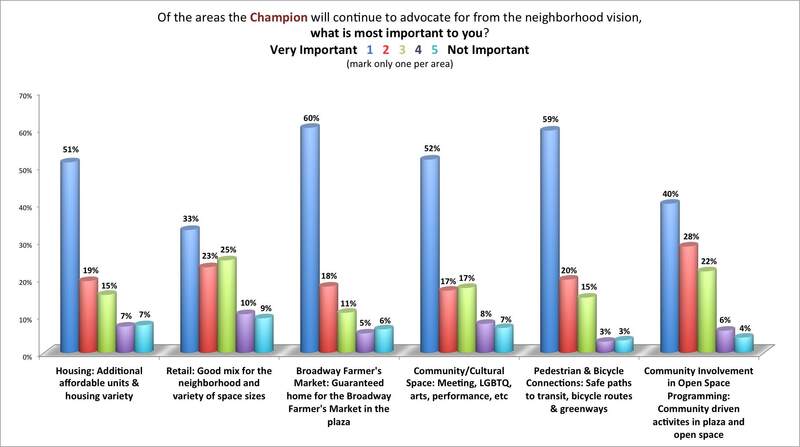 A full report of our community survey is included in the Prioritized Community Amenities document, written to assist potential developers in understanding community priorities at the TOD sites. The results of our July 2014 follow-up survey to the community can be found HERE and a full report including community comments can be found HERE. On January 31st, Sound Transit issued a Request for Qualifications (RFQ) from developers. The RFQ included a mandatory public meeting with short-listed developers and the Capitol Hill community that was co-hosted by Sound Transit and the Champion. THANK YOU to the “local experts” who came out to Meet the Developers! On Monday June 2nd, community members packed the Broadway Performance Hall to meet bidding developers and talk about community priorities at the Capitol Hill light rail station development. The meeting was hosted by the Capitol Hill Champion in participation with Sound Transit. Over 250 community members and developer team members were in attendance, and there was a lively discussion on twitter via #CapHillStation. A video of the meeting, summary of community comments and other helpful documents are available on our resources page. On July 22nd, 2014, Sound Transit published it’s Request for Proposals (RFP) from bidding/shortlisted developers. The Capitol Hill Champion does not have a direct role in writing the RFP, in evaluating proposals, or in selecting developers. The criteria for scoring developer proposals in response to the RFP was designed and reviewed by Sound Transit with input from City of Seattle staff. Review correspondence between the City of Seattle and Sound Transit regarding the developer selection process here and here. On April 23, 2015, the Sound Transit Board approved their decision to award a “master developer” contract to Gerding Edlen Development for all properties. Gerding Edlen will be an integral partner with our neighborhood for the coming years of construction and development. 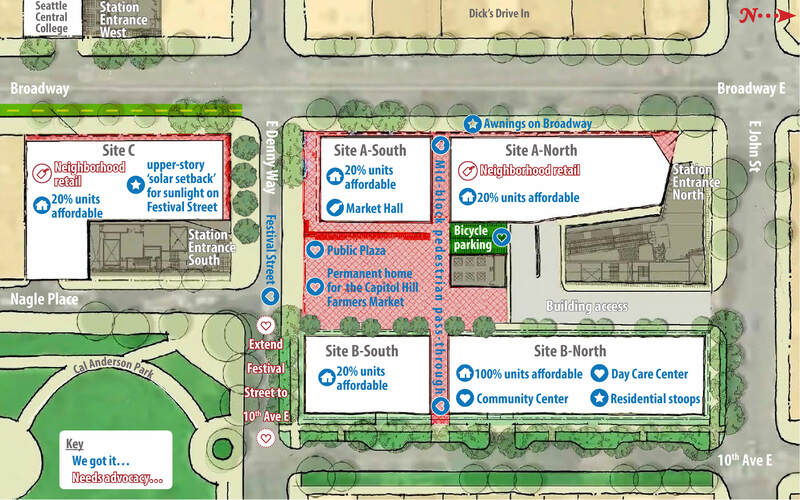 On May 16, 2015, the Capitol Hill Champion and Sound Transit co-hosted a community Open House with the selected developer for the Capitol Hill light rail station TOD sites. Approximately 150 community members took advantage of this opportunity to chat with the developer team, see what they have planned for the station sites, and celebrate the work that has been done so far. Sound Transit’s Ulink website and page on planning for transit-oriented development at the Station. Champion documents on community meeting space and union representation at the transit-oriented development. 9/14/2014: At the heart of Capitol Hill: Cathy Hillenbrand champions a neighborhood..